After selling homes in Murray, KY, before a closing in Paducah, KY, following the preview of Kentucky Lake Homes with a buyer from Florida, sending information on Lake Barkley to a homeowner tired of the Wisconsin winters, and emailing MInnessota buyers about Malcolm Creek Resort on Kentucky Lake, the Fredrick family entertains a crowd with some bluegrass music. 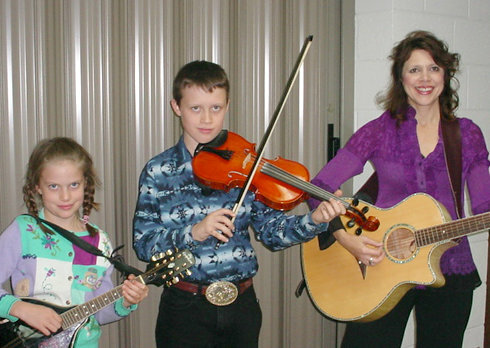 Victoria played mandolin, Joe played fiddle and Valerie accompanied guitar. One of the favorites is a song called, "Dooley". This song reminds me of the people who used to live in the hill country of Kentucky. "Dooley" ran a still with the help of his wife and daughters. This was his means of familial support as he successfully evaded the revenuers. When "Dooley" died, all the men cried. Once you hear a few bluegrass tunes, you will recognize that this is a juxtaposition. Usually the women cry at the point of death, in Kentucky. But, in "Dooley's" case, he is the source of alcoholic refreshment, so all the men cried at his death. Welcome to Kentucky. Accolades to the dry counties that still exist in our area and that made it possible for "Dooley" to make a living. It is a tribute to a time before the lure of the revenue that can be made by selling liquor and the push of the tourism boards for alcohol sales. We have maintained a very family atmosphere on both Kentucky Lake and Lake Barkley with the history of the dry counties. More on this blog later. But I love it. Having come from an area where liquor was purchased freely in every grocery store, gas station, bar & restaurant, I love these dry counties. Murray has liquor by the drink in eating establishments, legalized since I have moved to Murray, KY. Paducah KY residents of McCracken County are a "wet" county and alcohol sales are not restricted like Marshall and Calloway County. Note Livingston is also a dry county. I have provided a list below. A dry county is one whose government forbids the sale of alcoholic beverages in some form. There are hundreds of dry counties across the United States. About 18,000,000 people live in the 10% of the area of the US that is dry. When the national Prohibition was repealed in 1933, a large proportion of the population continued to support prohibition. Some states chose to maintained their own prohibition and others permitted local jurisdictions, mainly counties, to decide whether or not to continue prohibition within their borders. This is called local option. Here is a list of dry counties in Western Kentucky, some of which surround Lake Barkley and Kentucky Lake. I have not verified all of the counties listed, but thought you might find this interesting. Is is safer to drive in Kentucky? Do we have less DUI's? Is it safer to live in Murray, KY due to the dry county status. Marshall county has a lot of winding roads by the lake. Calloway county has narrow county roads leading to excellent fishing spots on Kentucky Lake. Are you safer to drive these roads in a dry county? Is Livingston County a safer place to buy real estate because of its dry county status?